So just what does one play to demonstrate the resources of a large, beautifully voiced new organ? 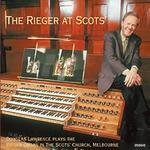 Douglas Lawrence has tried here to show something of the immensely wide tonal palette available on the Rieger organ at The Scots' Church in Melbourne, completed in 1999. On one disc it is not possible to give more than an aural glimpse of the endless possibilities in an organ as fine as this one. Nonetheless, there are magic sounds here and the listener will hear examples of many classical registrations from the great periods of composition.